Emma, Colin and Tara with big brother Connor Duncan ... 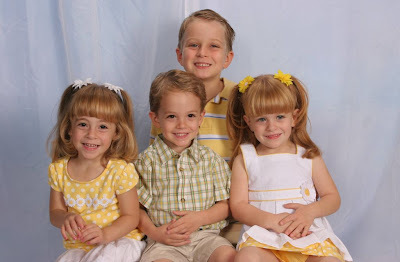 The triplets celebrated their third birthday on July 16th... HAPPY BIRTHDAY!!! ACT NOW for justice in Zimbabwe!! Lovemore Matombo and Wellington Chibebe, the President and General Secretary of the Zimbabwe Congress of Trade Unions (ZCTU) were arrested on 8 May for speaking out about the state-sponsored violence in Zimbabwe - or as Robert Mugabe's government put it "spreading falsehoods prejudicial to the State". Lovemore and Wellington are due to appear in court on 30 July, to defend themselves against these charges. Over 2,000 trade unionists from around the world have come together to make a public demonstration of support for the ZCTU leaders and all unionists in Zimbabwe. I am a satirist (musical) myself. I am married to a visual artist who does satirical political cartoons here in Sweden. As artists, we are constantly defending freedom of expression. HOWEVER, if this picture had appeared on the front page of any mainstream or conservative publication, it would have been correctly identified as what it is: Right wing racist propaganda featuring slanderous stereotypes. Instead, you have sullied the pages of the illustrious New Yorker with this disgusting image, leaving the media to hail this as "satire." Satire reveals truth. This image obfuscates the truth -- in an era when truth becomes increasingly harder to find. It doesn't matter what sort of articles appear inside the magazine. You are perpetuating villainous public falsehoods designed to manipulate the fear and ignorance that abounds in this country. That ignorance abounds in large part due to a COMPLICIT media that does NOTHING to shed light on the real issues. Next month's cover should be an apology and a clarion call for a more vigilant media.